During our second week in Edinburgh, there were two PRACE trainings scheduled at EPCC. Both focused on the basics but we were still asked to have a look at them as some things could be useful. We were free to skip any lectures that we found to be not beneficial for us and work on our projects instead though. 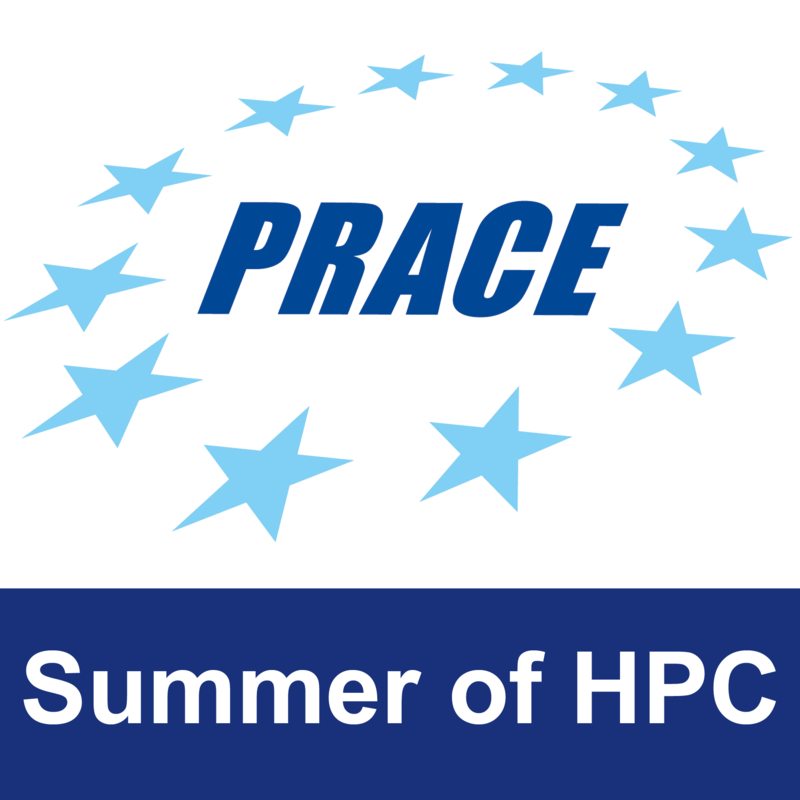 Monday and Tuesday were reserved for a general introduction to HPC. The vast majority of the content was all too well-known to us but it also taught a lot about working with ARCHER. 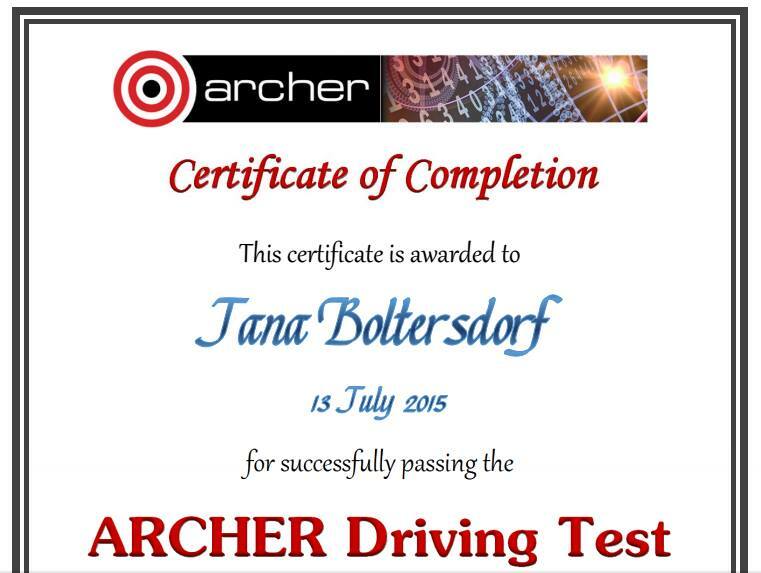 At least I will definitely work with ARCHER which made it a nice opportunity to get used to this system. 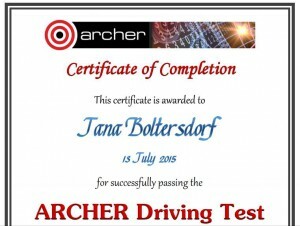 Another bonus was the ARCHER Driving Test – a test about ARCHER and HPC in general. Passing it allowed us to set up accounts for ARCHER with a certain budget of calculation time. Wednesday to Friday was dedicated to MPI. Although it was already covered during the training week in Barcelona, it was nice to review it all at a slower pace. In Barcelona, we rushed through the topics within just half a day. Now, we covered the same topics in three days – and believe me, the pace still wasn’t exceptionally slow. Also, there was more time for practicals which, again, utilized ARCHER. So, while there was little actually new content, it was a nice opportunity to review our knowledge (especially for me who’s going to work with MPI), get familiar with ARCHER, and, of course, also meet a few more members of the staff as well as visitors. Including that weird moment where I chatted with a lady who was originally from Switzerland and another lady told us cheerily “You can speak in German with each other!” and we just kept talking English. I still tend to switch to German accidentally when I’m distracted though. 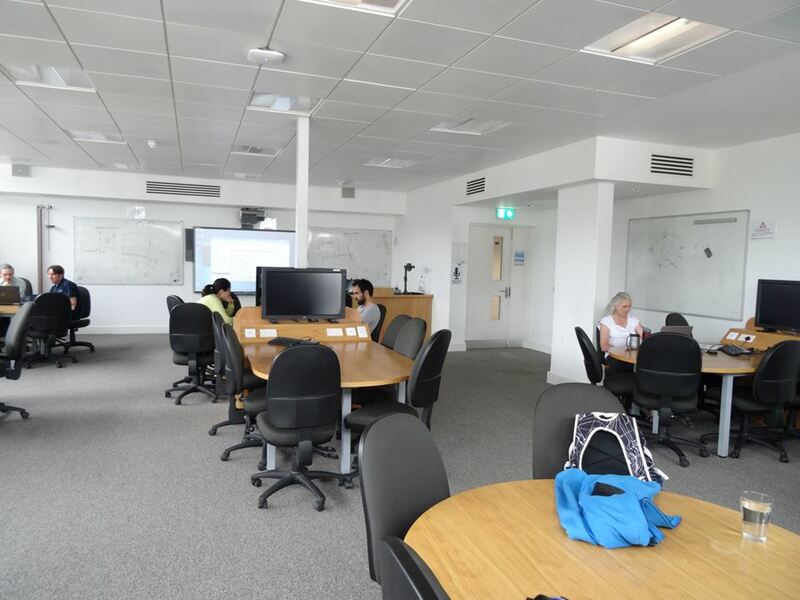 Because the whole week was reserved for the course, there was little time for meetings, except, of course, the weekly SoHPC telco on Tuesday and the usual technical difficulties with 21 people distributed over Europe trying to speak to each other online. And then suddenly it was the weekend again! Time for discovering Edinburgh! Catherine recommended the Festival Carnival to us, a highlight of Edinburgh’s Jazz & Blues Festival and again it was free of charge! It wouldn’t start until the afternoon though, so we started the day by visiting the National Museum of Scotland, planning to attend the Carnival later. The Museum itself is really nice and it’s HUGE as well. 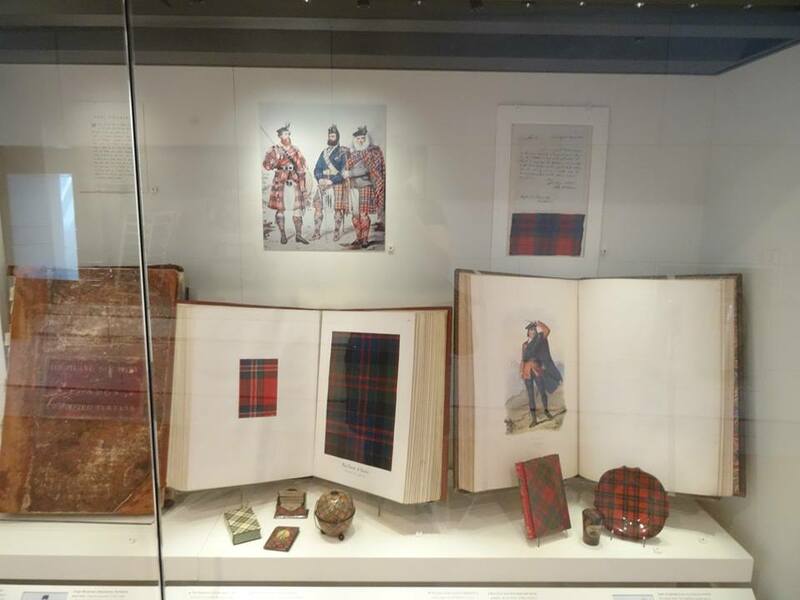 A bit clueless about what to see first, we started with the Kingdom of Scots exhibition that – as you might guess – deals with the history of Scotland and its people. It covers six levels and history from pre-Roman times to the 20th century. 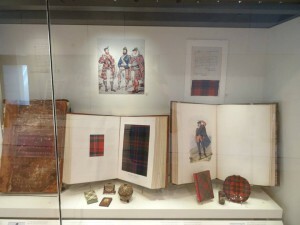 The exhibited items range from stunningly beautiful (like stained-glass windows) to scary (tools for torturing suspected witches) to mysterious (little coffins with dolls that are assumed to be a mock burial for the victims of the Burke and Hare murders) to irritating for foreigners (tartan suits), but everything has a connection to Scotland and adds to the diverse picture of this very special country. An aspect I truly enjoyed about the exhibition (despite not being the target audience at all) was how they tried to make it appealing to children! There are lots of places that encourage the youngest visitors to play and experience with all their sense. At least for some pieces touching is explicitly encouraged! There is also a garden with a lovely view on the roof of the Museum and even there they manage to present some information in an appealing manner! The plants represent the different Scottish vegetation zones from the flatlands to mountains and signs explain the monuments visible from the roof. It was somewhere near the top level that I lost sight of Ondrej and Anna. It wasn’t the first time. We often lost eye contact when I wanted to have a closer look at some item and they went ahead. But before, we had always found each other again within just a few minutes. This time, we didn’t. I didn’t even know whether they were still on the same level or had descended. After a while, I decided to keep enjoying the Museum. Eventually we’d find each other or just meet at home. No problem. 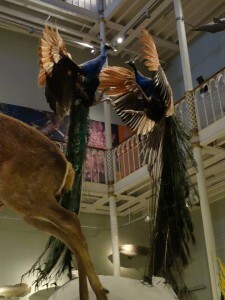 Stuffed animals are hardly a uncommon thing for museums but the National Museum of Scotland has not only a huge collection, but also the poses of these animals are often extremely life-like. They run, they fight, they mate. It shows all the aspects of the life of those animals despite all of the animals being dead. When I entered the exhibition, I immediately noticed two things. It’s incredibly stuffed – little space and lots of animals. 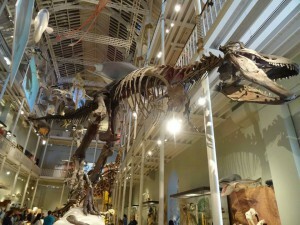 And there is a huge T-Rex skeleton right in front of the entrance. In the middle area, there were small platforms with multiple animals dedicated to a special aspect. On the walls, there were glass cases showing smaller animals but using the same approach. 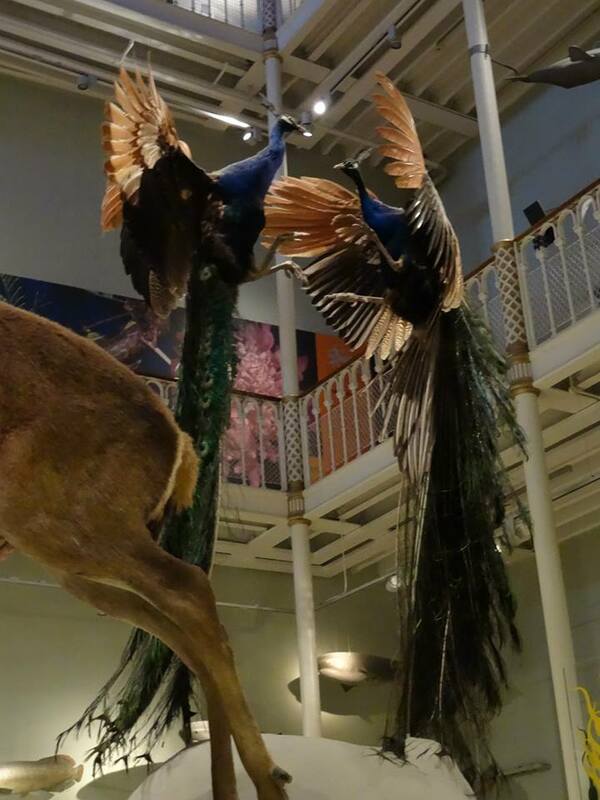 Personally, I found it a bit irritating that animals from all kinds of habitats were shown together without any distinction (ironically, they did that as a part of the pre-Roman Scotland exhibits) but I guess that’s a matter of taste. After a while, I got used to it and started to like the possibility of comparing the different approaches to aspects such as movement, fighting, feeding etc. within one glass case. The middle area was left open on the upper levels, forming some kind of a gallery to watch the marine animals suspended from the ceiling, floating on the height of the second level. A really interesting idea to preserve the impression of them swimming. In the meantime, Ondrej and Anna had written me a message suggesting to meet at the main entrance which I noticed a little too late. They were gone when I arrived there. However, I decided to keep enjoying the Museum myself and wandered around. Shortly afterwards, it started to rain heavily anyway. Not just a little rain, more like the “I can’t see the ground anymore because there is so much water EVERYWHERE” variety. Since I wasn’t too eager to get soaked, I was technically stuck inside the building. Well, the National Museum of Scotland is quite a nice place to be stuck so I didn’t mind too much and just kept wandering around. After quite a while, the rain finally lessened to a degree where it was possible to step outside and NOT get drenched despite wearing a raincoat. It still was damp and cold though and definitely not pleasant weather for a walk! Luckily, I managed to find my way back to the next bus stop and even got to stop at a nice place to get a delicious vegetable curry with rice and garlic bread for lunch (and warming up a little). I’m not used to getting my food on a disposable plastic plate, but hey, it was warm and actually quite affordable for Edinburgh standards! Later, I found out that Ondrej and Anna just had arrived at the Carnival when it started to rain. Turned out that it wasn’t too bad that I stayed at the Museum. 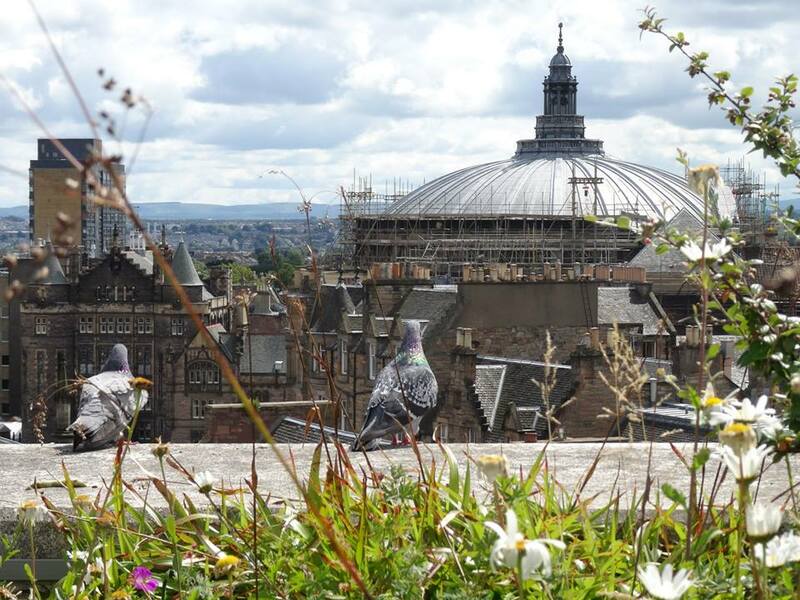 As usual, have a look at my Facebook for more photos (and more smaller updates on my Summer of HPC in Edinburgh)!